Coffee: Louisiane blend, French press. Get yourself a few thin slices of Fontina (a nice nutty taste for Autumn/Winter), two pieces of grainy bread, and some thin slices of a nice crisp apple. Granny Smith will do. 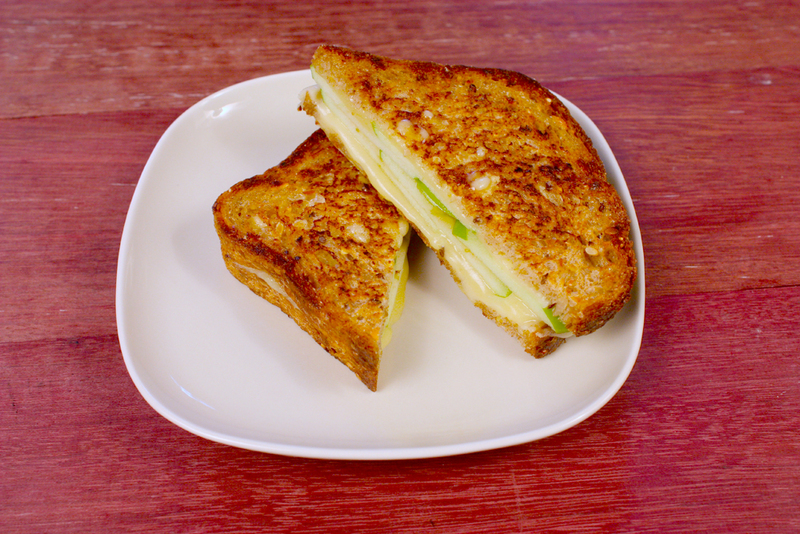 On the first slice of bread, lay down overlapping pieces of cheese, the apple slices and then another layer of cheese, and close with the second slice of bread. Film a skillet with the olive oil, and get it hot (but not smoking) over medium heat. Brown the sandwich on both sides, and lower the heat under the pan, letting the sandwich steam long enough to melt the cheese. Cut on the diagonal to get the most melted cheese per mouthful. We aren’t big fans of making grilled sandwiches with butter. It burns too quickly and that just won’t work. Because it isn’t the application of heat that melts the cheese, it’s the steam. So while you want the exterior of the bread to get crisply brown initially, you also want to be able to lower the heat and leave the sandwich in the pan long enough for the cheese to ooze. That’s why we use olive oil, and right now, the only olive oil in our kitchen is from Georgia Farms, the first commercial harvest of olives east of the Mississippi River, since the late 1800s. It has great great flavor with a lovely young green color and aroma – worth the mail order.